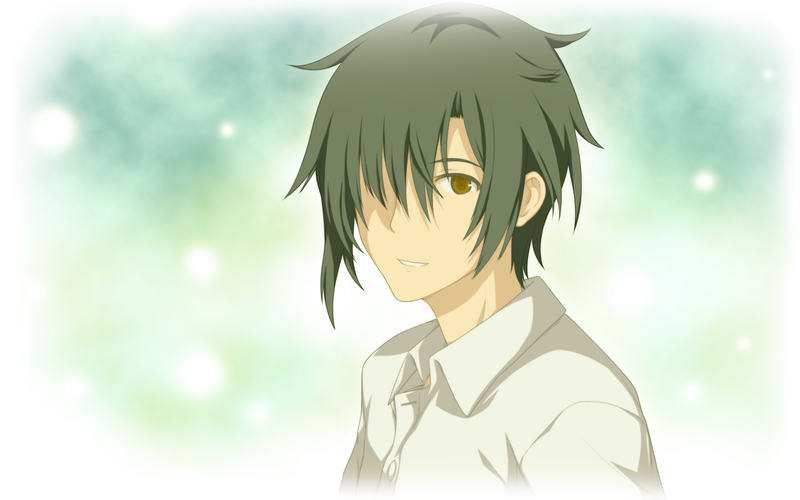 Haruna Riku lived in an orphanage in the city of Tsukigasaki, he was very lonely and longed for a family, until one fateful day when he met Yuuki, a strange girl of pale skin. Even though she was afraid of other people, she easily became friends with Riku and the two played together all the time. However, Riku developed a strange power known as Runes and was recruted by the Chronos syndicate as an Elfin, so he could put his new found abilities to good use. This meant he was forced to be separated from his only friend, but what Riku didn’t know was that he parted from someone else who was also very important for him… She was Hotaru Rinne, a girl who shared the same father with Riku. 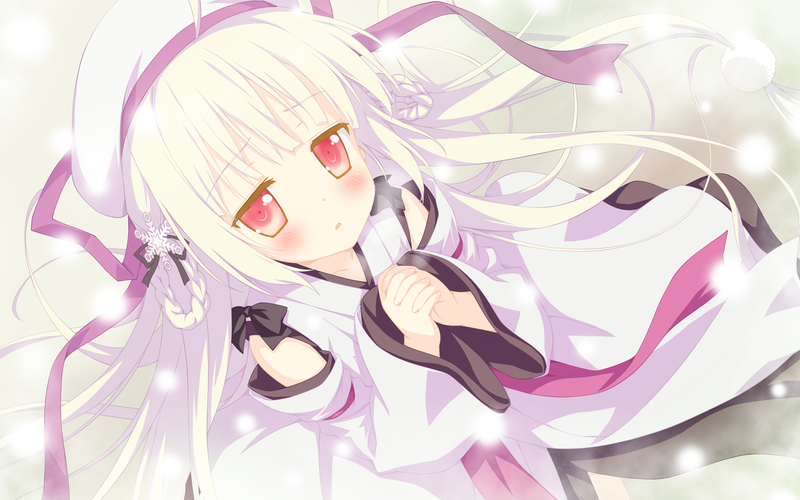 When her mother died, she left a letter revealing Rinne had an older brother who was abandoned. 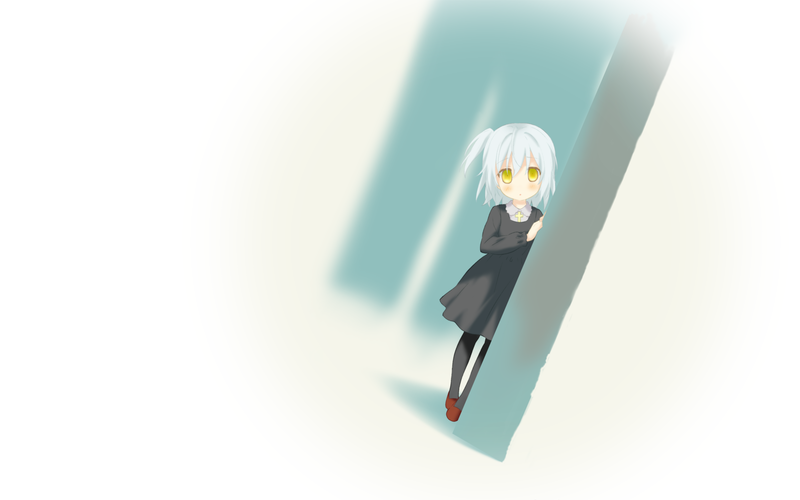 Rinne made into the same orphanage as Riku, but she didn’t had the courage to approach him. 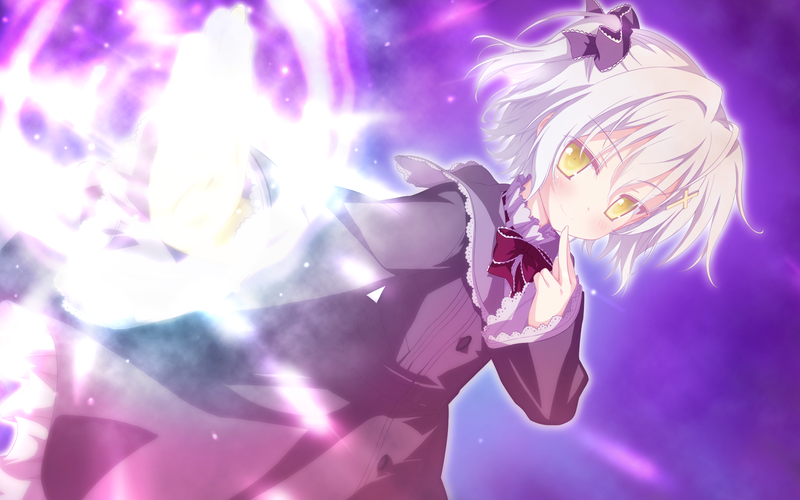 However, when Riku became an Elfin, she got desperate and, somehow, was able to acquired Rune powers as well. Thanks to this, she also was able to join Chronos, but Riku had nearly forgotten about her. 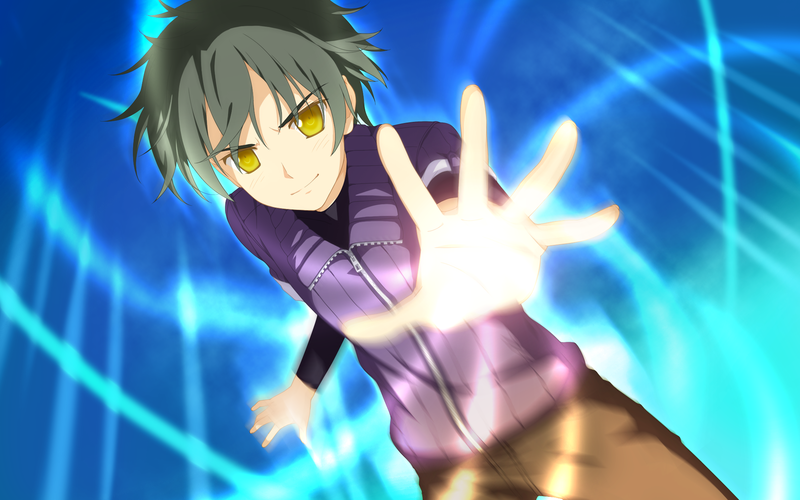 Riku’s specialty was Hypnos, which uses hypnosis to seal a target’s Runes or to make someone’s Runes even stronger. 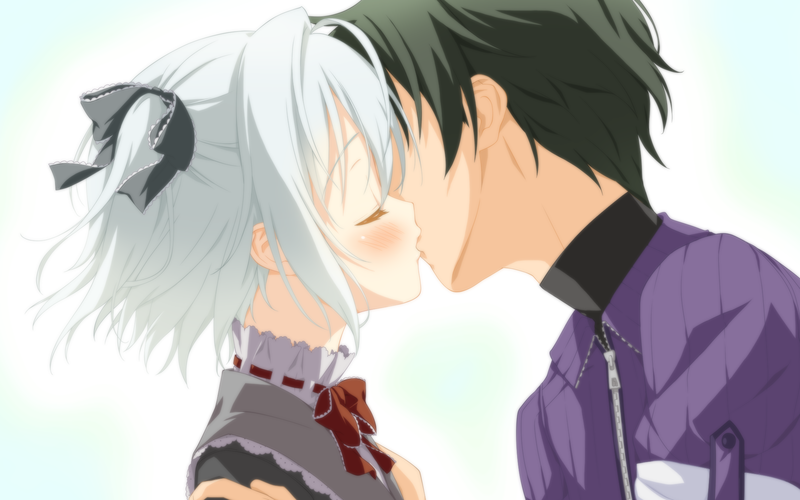 However, the activation trigger was a kiss, and it would only work with those who wholly trusted him. 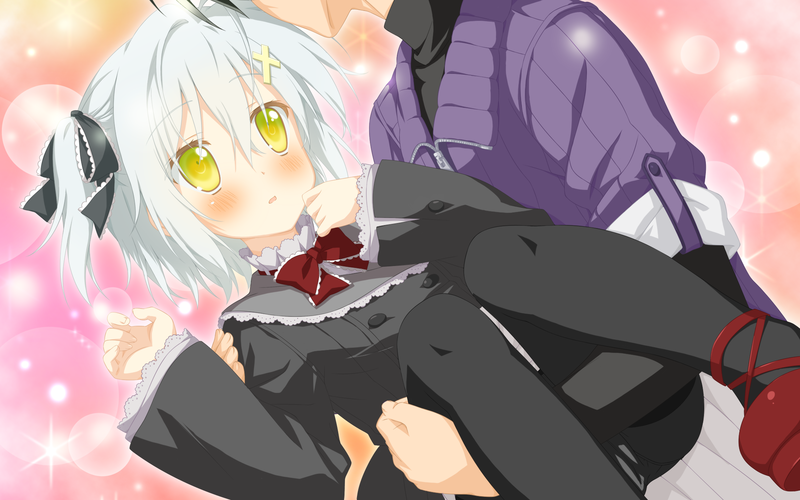 Rinne was the only compatible and this made them become really close, eventually leading the siblings into becoming great partners. 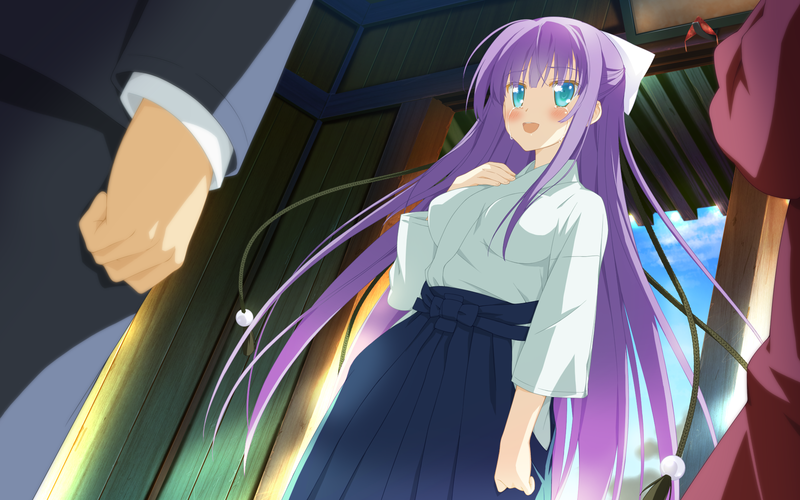 Still, Rinne could not bring herself to reveal their true connection because, at this point, she had fallen in love for Riku, thus she was too afraid this could destroy their current relationship. Years later, the two were sent back to Tsukigasaki as a team to investigate recent cases of berserk Elfins and the mysterious winter that has been lasting for over 2 years. Since their boss’s daughters lived there alone, they were to protect them as well. 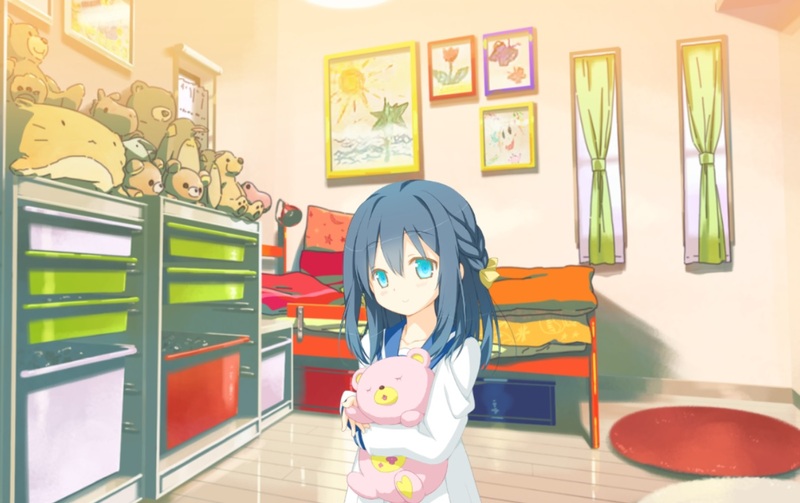 Riku transferred to the same high school as Tachibana Ochiba and was instructed to live with her under the same roof as well, but was instantly rejected by her, until he gained her trust by befriending her younger sister Hadzuki. 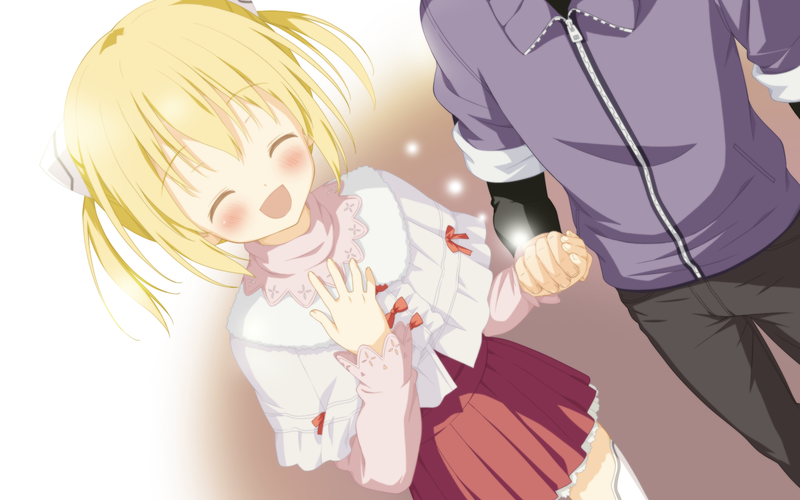 He soon became friends with Yunagi Ichika, an earnest and energetic girl who was Ochiba’s best friend. Her older sister was the chief of the Valkyrie Laboratory (shortened as “Valken”), which Riku suspected to have some connection with the recent Elfin cases. 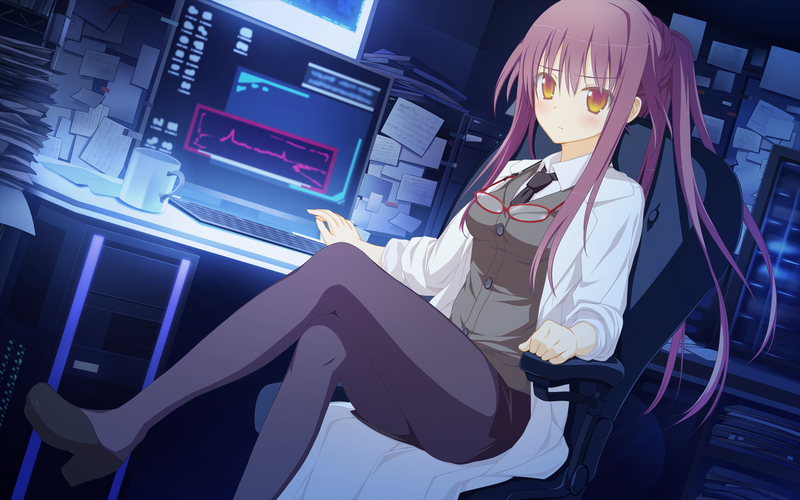 Working as a spy for Valken is Mizunose Kotori, a bitter and traumatized girl who believes there’s no place for her in this planet. Ironically, this unstable lady is the 2nd most powerful Rune user in the world, thanks to her unique ability: “Apotsu” – that lets her cut pretty much anything, even things that are not “meant to be cut”. She is completely broken! Valken also has interests in robotics, as they enrolled an android in the same school as Riku: Korona. While most people avoided her peculiar company, Riku accepted her as a friend, which also gave him more opportunities to investigate Korona’s organization. Who Riku didn’t expect to find was an unchanged Yuuki next to their special place: The old clock tower. 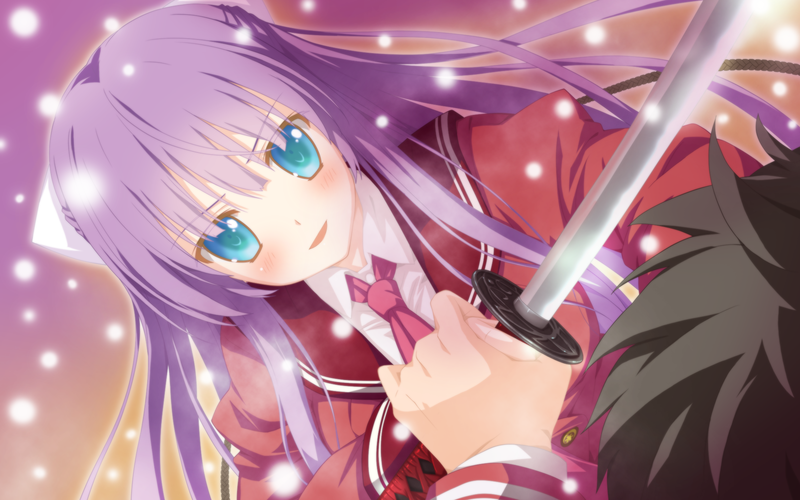 What is Yuuki’s true nature? Could she be linked with those mysterious events? The art style by Shida Kazuhiro is pretty decent, he uses a moe style full of bright color, giant eyes and girls who never look older than 15 (even when they are supposed to be past their 30’s). Therefore, if this is not your thing, chances are you will not become emotionally invested by dramatic scenes featuring moe-blobs, which turns difficult to appreciate this game. The art-quality is fairly high, but you can pretty much tell when it’s not the same artist. This is especially true for the backgrounds and sometimes the difference in styles are so uncanny that it can be distracting. The constrast can be so big that it seems like it’s just a wallpaper in background, other times they just bluntly use a photo that was likaly meant to be used only as reference. The poses are very expressive and not ridiculous as many other titles. There are many variations for facial expressions and clothes. 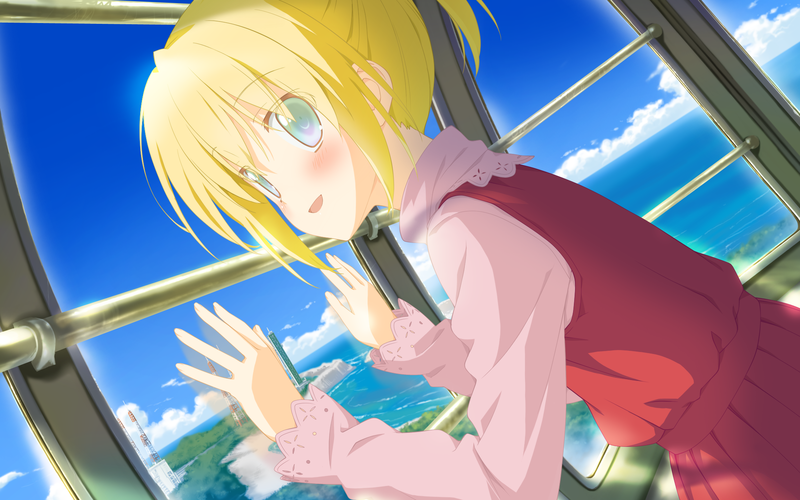 The CGs are also plentiful, so you will not get tired from seeing the same graphics all the time. 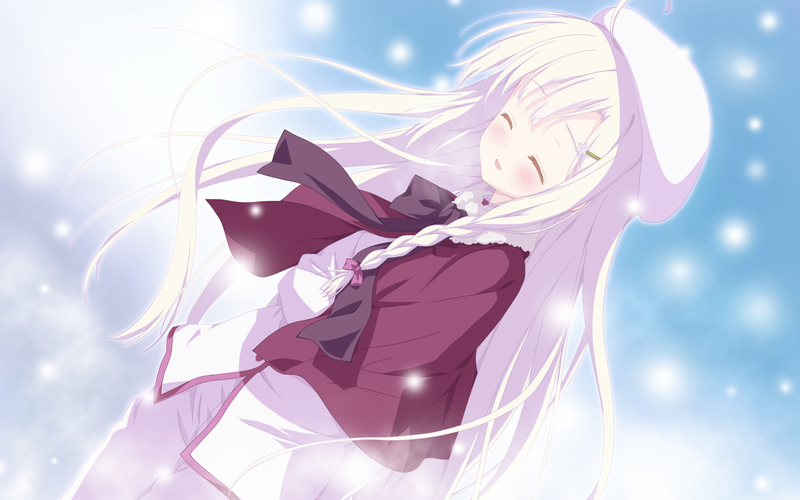 This game’s main motif is winter, so you will be seeing white everywhere and many events will have a snowing effect. This is quite a change from the usual “sakuras everywhere” theme for 99% of Japanese stuff. Those guys sure love some sakura petals, to the point where the first thing that appears when the winter finally ends are the damn Sakura petals! The performances are above average, but since there are not many high level voice actors working here, there are some limitations. For example, when someone cries, you will usually just read a narration explaining that a character is crying. The voice-director probably knew they would not be able to do a convincing crying scene, so he just didn’t record them. This was for the best, but it’s not a very praiseworth thing for a professional game. There are many long explanations that are unvoiced, probably to save some money. This happens really often and it feels cheap and half-assed. Thumbs up for Midorikawa Hikaru – one of my favorite seiyuus – who plays two super-minor-roles, because his services were probably too pricy. Kadowaki Mai from Atelier Rorona fame also plays the annoying Miko, but she is not “capturable” because this would be more expensive. The worst possible performance you can listen here is from Ochiba’s father. He is awful when trying to do serious scenes. He tries to do this really husky voice during serious scenes. Perhaps he’s trying to imitate David Hayter, if so, he’s doing a really poor job! Not half bad! The soundtracks include a good variety of intruments like piano and violin, but there are many digital sounds that are used well and fit with the scenario. The vocal songs are energetic and pleasant to the ears thanks to the skilled singers and good lyrics that doesn’t sound as stupid as most of Galge songs. This entry was posted in Galge and tagged FAVORITE, Galge, Review. Bookmark the permalink. 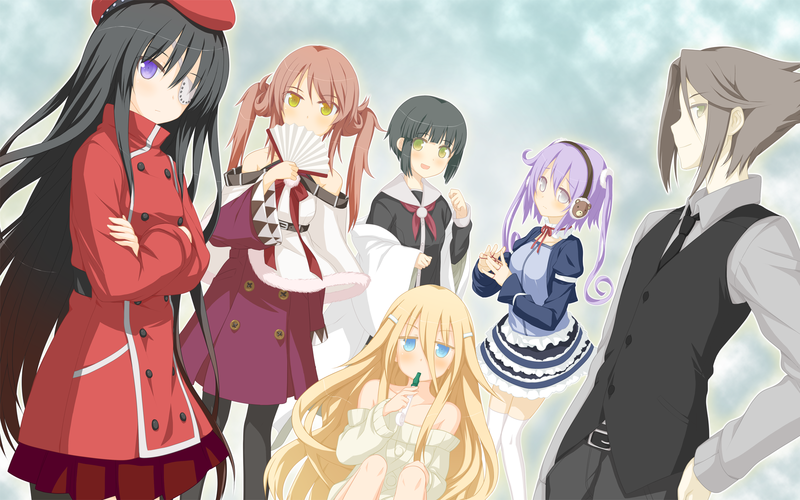 Really good review about AstralAir no Shiroki Towa there. 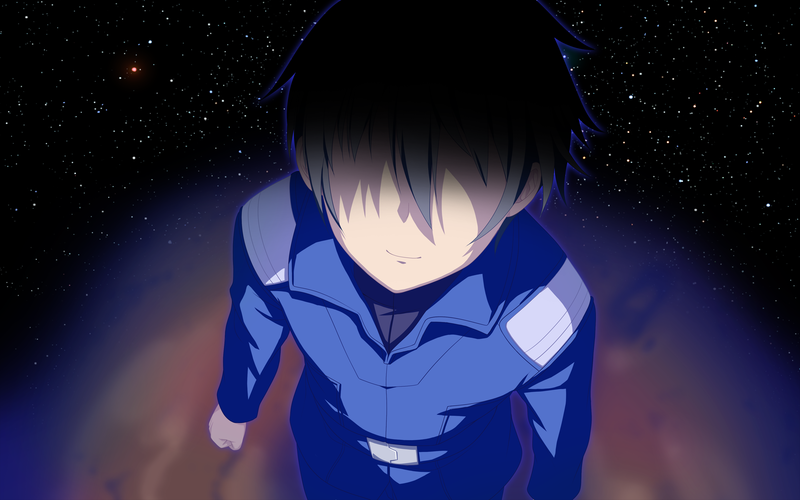 I’m playing AstralAir no Shiroki Towa and already at the last half of Ochiba’s route., but now I’m sidetracked with Dynasty Warrior 8 and Football Manager 2014 because I just bought those two. For art, I almost thought those background in AstralAir are photos if I don’t look it more carefully since it looks really realistic. Still, it’s a really high quality art. 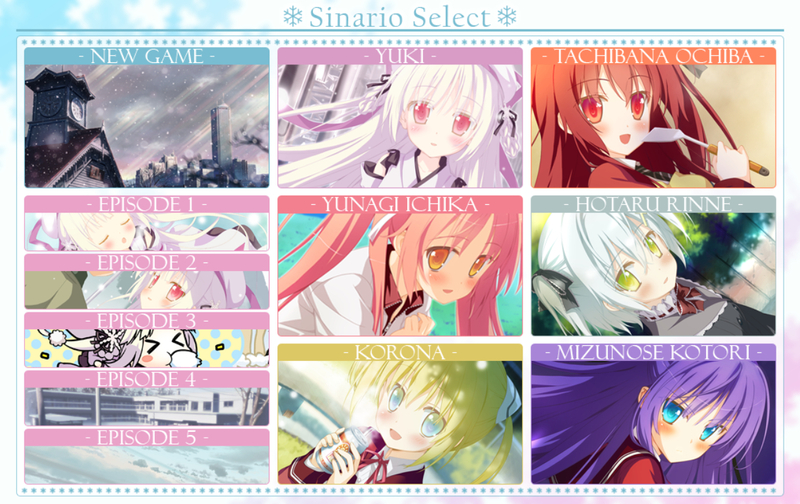 Definitely a tough competitor for Sakigake and Koi ga Saku to win Bishoujo Game Awards in Art category. 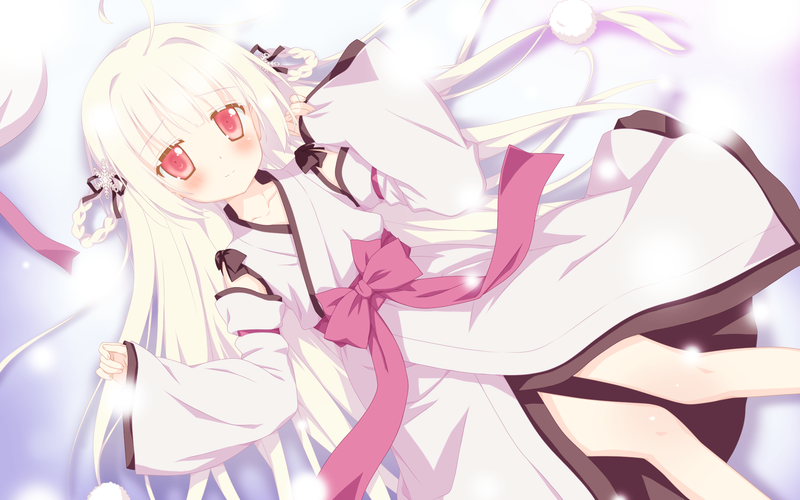 Well, Nikaidou Shinku (Irotoridori no Sekai) is still the best loli ever!!!! I am pretty sure some of the backgrounds are not only “realistic” but it’s actually just a photo with a photoshop filter. I can do the same thing and get similar results. I mean only its music that reach “kamige” level (for me). Other aspect still fall short to reach “kamige” level. that’s what I mean there. In other word, it’s still not reach “Kmaige” level in overall. 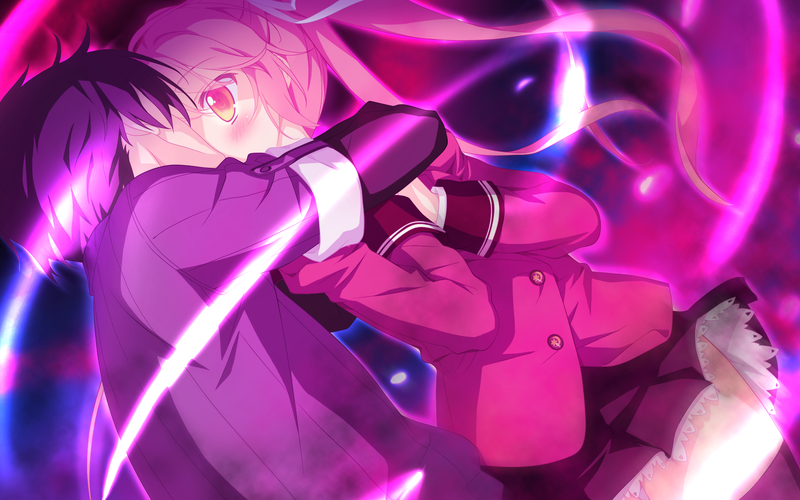 Well, it’s still a really good eroge in overall. Also, I can’t say that I’m agree with you about your opinion about “kamige”. 7/10 for BGM. you’re not being harsh right? Then, what if you include its OP songs, ED songs, and insert songs? how is your score for its music if you include those? I’m an amateur when comes to art, so I can’t talk much about it. So what I said there is how I see from my eyes and how I felt about it. 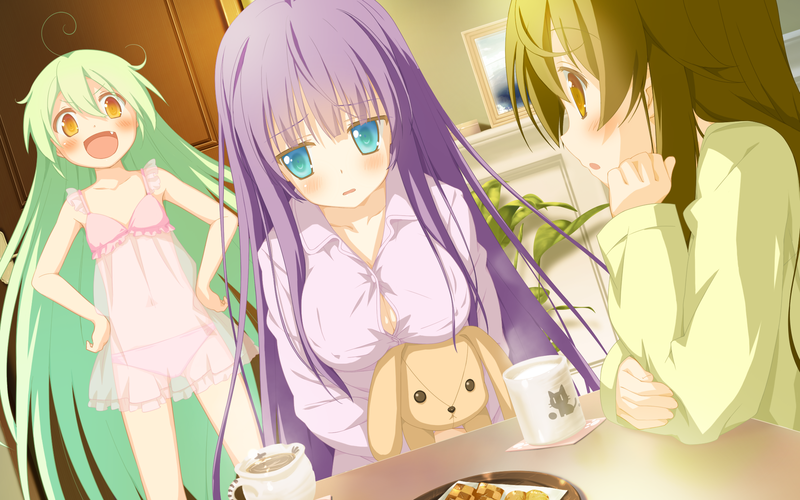 Stiil, I think their art are much improved than their previous eroge, Irotoridori no Sekai. btw, I want you to show your result to me if you really can do the same thing with backgrounds up there. Btw, I almost forgot about this. 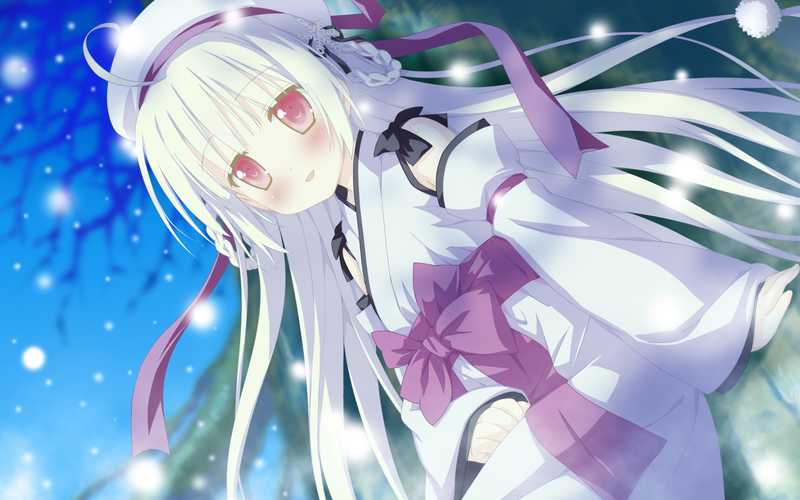 I agree with you that there are some connection and similarity between AstralAir no Shiroki Towa and their first hit, Hoshizora no Memoria. Even from beginning I already found some similarity between them. Sorry if I got that wrong. I don’t really use this word, but since there are some people asking me about kamiges recently, I am trying to adapt by using this term more often. Harsh? How come? 7/10 is a pretty good score! 5 is mediocre and a 7 is two points above the average. It’s bad when it’s 4 or lower. Scores can be very deceiving, that’s why I don’t use them. BTW: Yes, I am including the OP and ED songs. Whitout those, it would be a 6/10. I wasn’t exactly saying they are just similar, but I was implying they exist within the same universe, like the DC or Marvel universes. Is that so unbelievable to the point that you want me to upload a file just as proof? I thought this effect was actually pretty normal for anyone. Rather than an image, how about a video showing the whole process step by step in real time? 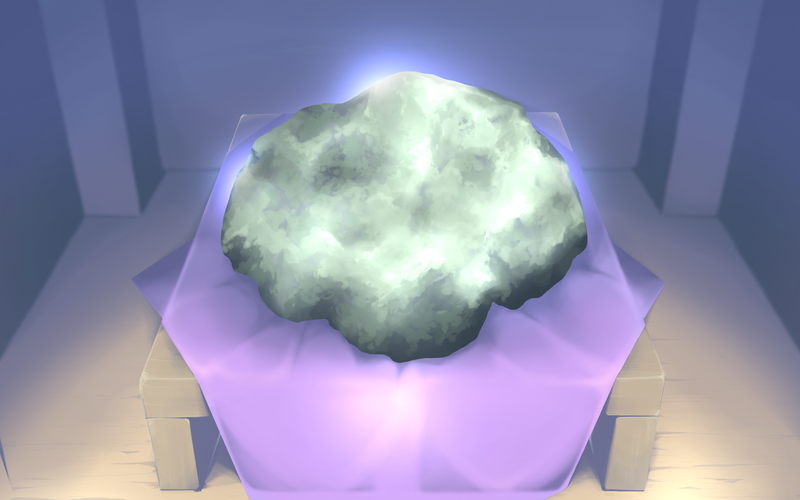 You can even learn how to do it yourself! GIMP is a free and easy to use program. I think no eroge will be “kamige” of you use that term. Perfect in every aspect. That’s almost impossible for eroge, unless the term of your “perfect” is different than what I I think. Forget about it. looks like it’s only difference our feelings towards it and terms of scoring…….and I’m much kinder in my scoring too. So are mediocre = decent for you? if not how score for decent in your terms of scoring? 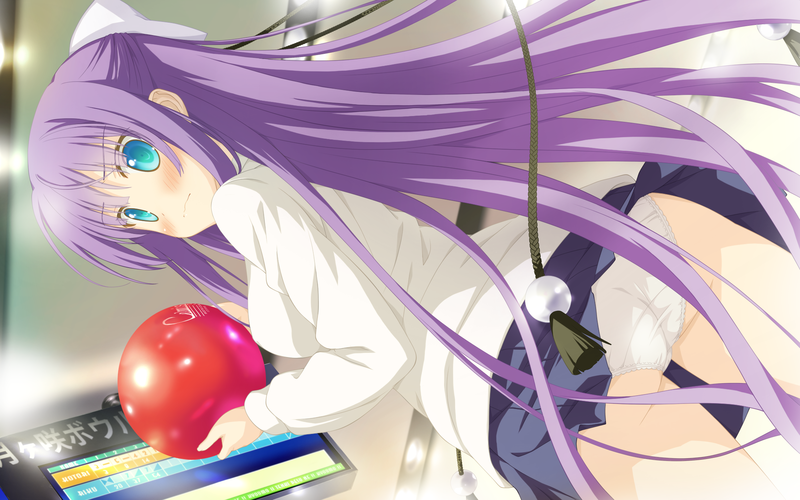 p.s: If you see me score an eroge 6 or below in overall, my advice is you better avoid it. I doesn’t mean that too. 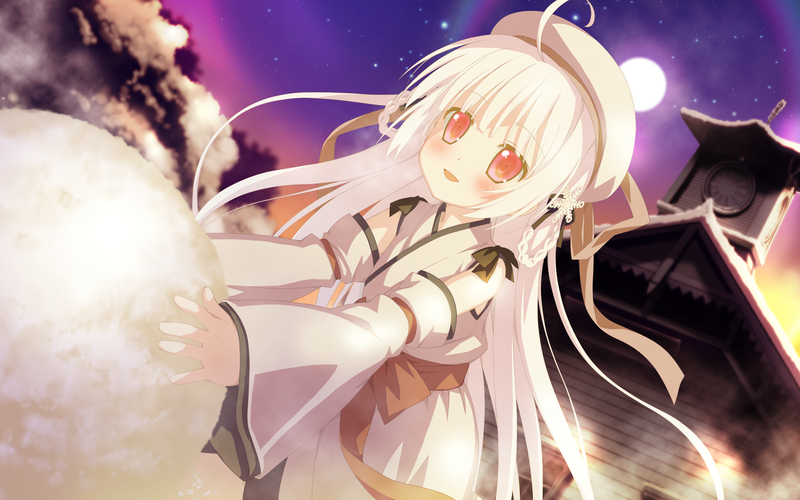 Just like the protagonist is a transfer student and 2nd year highschooler, Mare and Yuuki, mysterious girl/woman…….It just kinda hard to explain their similarity, so the only thing I can say is…when you play AstralAir no Shiroki Towa, it will reminds you to Hoshizora no Memoria in a way or more. If they really did the same thing like in the video, I really praise them because those backgrounds they worked on are pretty high quality……though I still have some doubt. Okay, I will take a note about what you say. 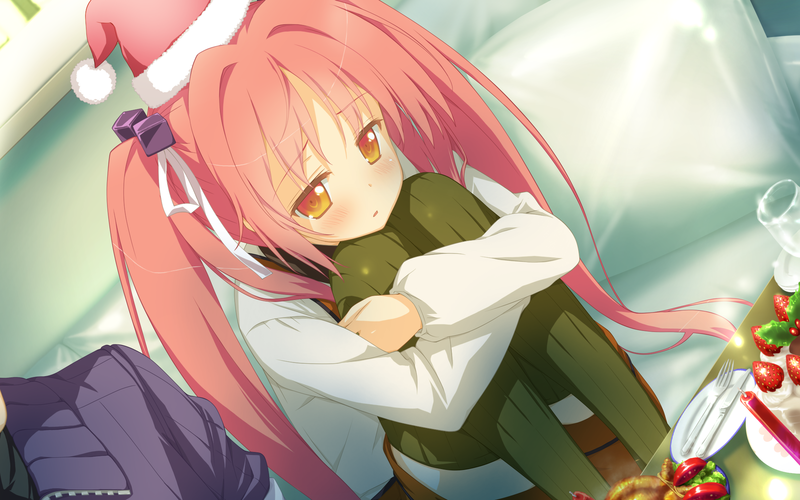 So If I see an eroge that get a 7 at anything from you, maybe I should try to play that eroge too. btw, 5 still looks bad for me, that’s why my “okay” zone is in 6.1 – 7. I blame my family for that. 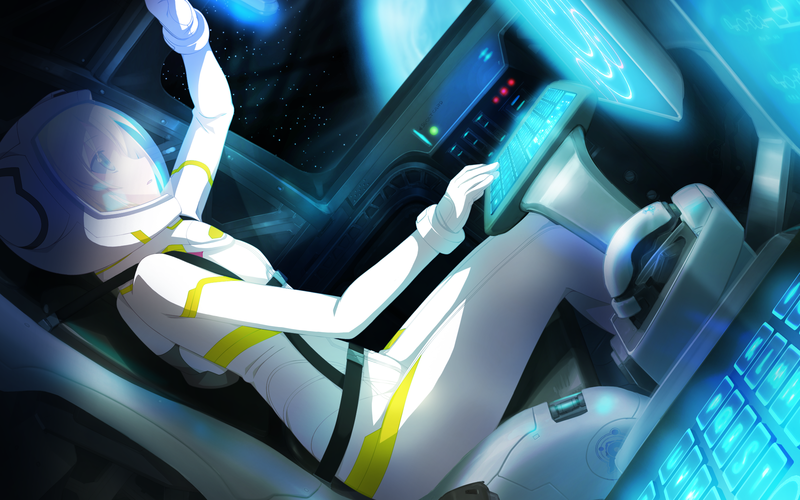 It’s better we stop talking about whether backgrounds in AstralAir are photos or not. It just only make me more confused when thinking whether they’re photos or not. 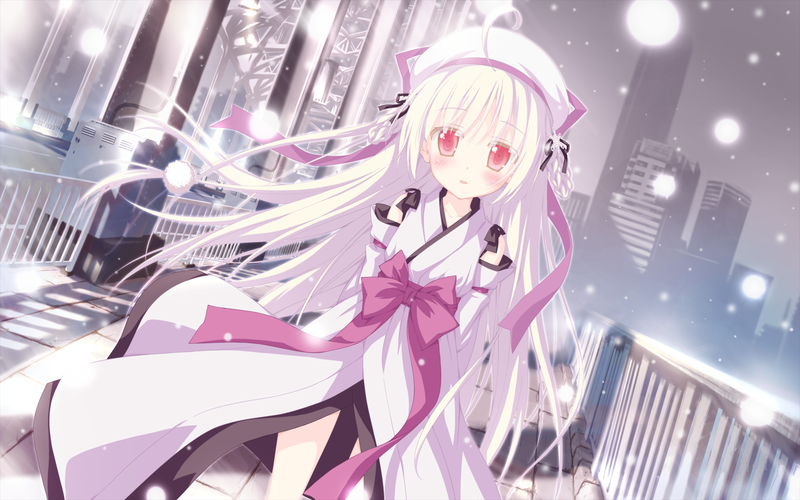 Outside the talk about whether its backgrounds are photos or not, I’m still sure that it will ranked in the top 5 at least in Art category in Bishoujo Game Awards 2014. Yep! All this talk about “kamige” or “kaminage” is too confusing. Let’s just say the game is far from being a perfect experience. I believe they reveal later it is “valkyrie” because of their “maiden of war project”, but every time they say “Valken”, I think about “Valkenhayn R. Hellsing”! 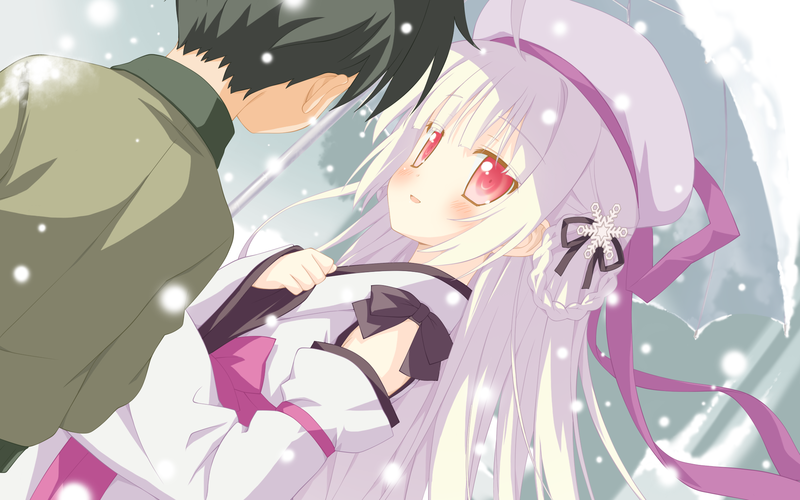 How about a loli fairy of love and snow from SPACE? SPAAAAAAAAAAAAAACE!!! Ochiba had a chuuni-fight, though. It was an arc to rescue a certain loli. But since it comes early than usual, it’s kinda forgettable. 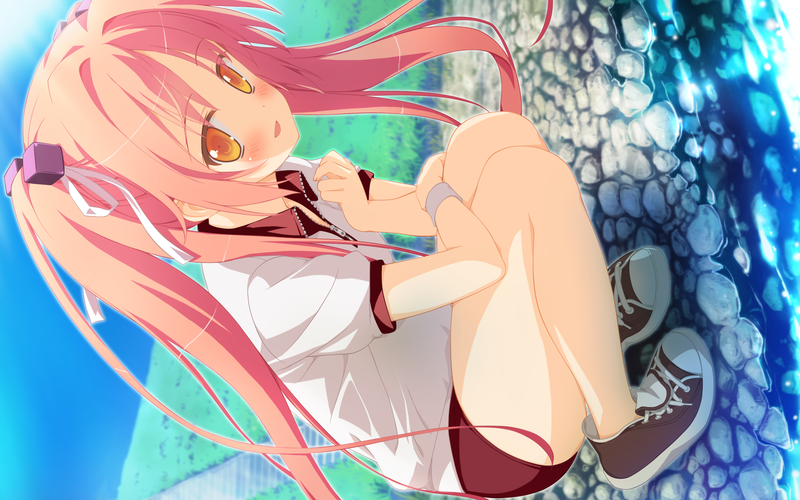 I think Ichika was the one with a route without chuuni-fights. HOLY COW! You’re right! 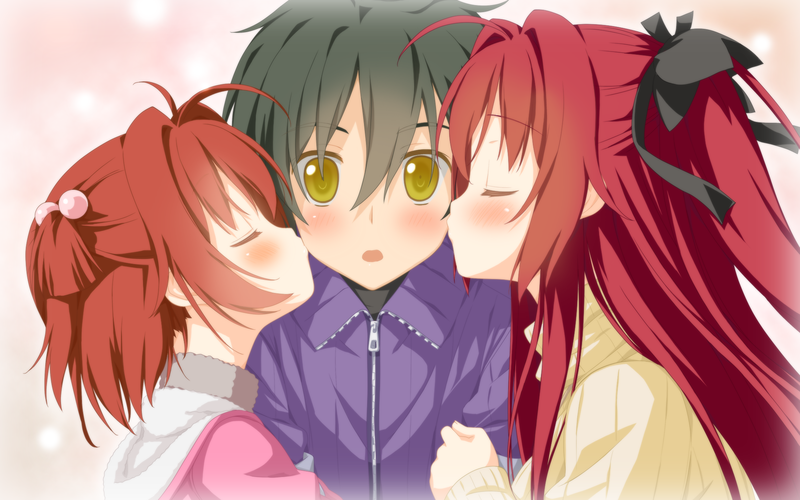 One of the writers (Hozumi Kei) worked on Clover Day’s, now everything makes sense! I should have looked further into this beforehand! I wouldn’t consider this game a kami-ge (although very close to it to be borderline kami-ge) but it is still the best game I have played this year, with Hello-Lady coming close behind. This game’s quality is also top-notch in every aspect so it deserves at least an 8 or 9 score for me in all areas, very few other games can match it tbh, and I am normally very picky with games. Although I like Hello Lady better, it’s true that this one is among the best Galges of this year. But I think there’s still plenty of room for improvement and I have faith that those developers can live up to my expectations, so I hope we can see even better titles that truly deserve to be classified as Kamiges, before the end of 2014! Sorry guys; kusoge from me. Everything is how I DON’T like it, and none of it ever made sense, in addition to the entire story being way too freaking long. What? slow pacing? Long story? I don’t know what are you talking about! I used my “Hijiri button a lot during this playthrough, so it was pretty fast for me! Likewise, I don’t care for or even despise some of the games that you love or even consider to be kamiges. But I don’t care much about that, since the important is to be able to talk about games with smart people. Of course, it’s even better when we just happen to like the same game! Touche. Getchu’s Best Games are pretty vague, and I have no idea who the hell gives them out, so point taken. However, in my defense, I just want to say that they’re USUALLY (not always) given to a relatively “good” game, so it’s not a bad idea for a casual player to just pick games to play based on that tag.